This highly competitive, top-ranked program has progressed the careers of well-respected and highly successful education leaders across Virginia and nationwide. The Educational Leadership Program, also called ExSEL, prepares individuals who recognize that America’s future depends on imagination, creativity, disciplined inquiry, and team work. It is unique in its approach, deeply engaging a cohort of school leaders in a community of practice, similar to the environment they will then create for professionals in their own workplaces. This approach integrates knowledge and skills from a variety of relevant disciplines into a set of carefully designed learning experiences to transform individuals into evidence–based leaders. This is a part-time, cohort-based program located at our Falls Church Center with classes held primarily one Friday and Saturday per month for your convenience. Two courses per semester are completed during the first two years of the program and independent research on a capstone takes place during the second two years of the program. Our goal is to support our students in finishing the program within four years, so we keep our doctoral cohorts small so that we can provide individualized support to our students. A new cohort starts biennially - every other year. The next cohort will begin in summer 2021, with recruitment beginning in fall 2020 and applications due January 15, 2021. Applications for the Ed.D. program will start being accepted fall 2018, with a deadline of January 15, 2019. Admissions will be on a competitive basis with the following requirements for initial consideration. Following a screening of application materials, selected candidates for admission will be invited to a mandatory assessment session with all faculty at the UVA Northern Virginia Center. Activities will include an introduction to the program and Q&A, a case study exercise, a short speech on a leadership topic, an individual interview, and a writing sample. Admission offers will follow this assessment session. The application due date is January 15th with acceptances to be determined by late February. Six core leadership courses will be organized in a sequence that covers leadership theory, problem framing, designing learning environments, and implementing transformative leadership practices. In addition a six-course sequence in disciplined inquiry will focus on the development of students as a practitioner-scholars who are skilled in research and problem solving. Electives will allow leaders to customize their program with an area of specialization, such as educational entrepreneurship or innovation in curriculum and instruction. The Doctorate of Educational Leadership coursework is a two-year, part-time program. Students vary in the length of time required to complete their capstone dissertation, but the cohort format and research course sequence is all designed to provide maximum support for a timely completion of the program. Course delivery is tailored to the needs of working professionals with weekend classes and summer residencies. Program coherence is sustained through online interaction and face-to-face contact on a monthly basis. The blended course delivery permits ongoing communication among peers and instructors while maximizing the utility of face-to-face class meetings. 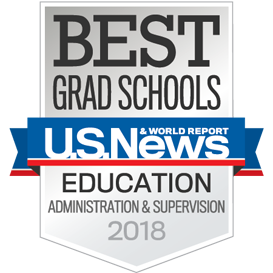 Graduates of this program typically serve public and private schools, state and federal education agencies, and other organizations serving the professional needs of educators.